Studio Line: Walt Disney Pictures - Meet Two Unlikely Heroes With A Bone To Pick. Get ready for outrageous fun in Disney's 102 Dalmatians. It's a brand-new, hilarious adventure, starring the audacious Oddball, the spotless Dalmatian puppy on a search for her rightful spots, and Waddlesworth, the wisecracking, delusional macaw who thinks he's a Rottweiler. Barking mad, this unlikely duo leads a posse of puppies on a mission to outfox the wildly wicked, ever-scheming Cruella De Vil (Glenn Close). Filled with chases, close calls, hilarious antics and thrilling escapes all the way from London through the streets of Paris -- and a Parisian bakery -- this adventure-packed tale is wacky good fun your entire family will want to howl over again and again. Box Office: Budget: $85 million. Opening Weekend: $19.883 million (2704 screens). Gross: $66.662 million. DVD: Widescreen 1.85:1/16x9; audio English DD & DTS 5.1, Spanish & French DD 5.1; THX; subtitles Spanish; closed-captioned; single sided - dual layered; 42 chapters; rated G; 100 min. ; $29.99; street date 4/3/01. Supplements: Deleted Scene "Cruella's Release"; Three Behind-The-Scenes Featurettes - "Creating Cruella," "Animal Actors" And "Designing Dalmatians"; Audio Commentary With Director Kevin Lima Plus Animal Coordinator And Trainers; "Puppy Action Overload" Featuring Puppy Auditions, Outtakes, Great Scenes From The Film - Music Video-Style; "Dalmatians 101" - How To Pick A Dog That Fits Your Personality, Narrated By Waddlesworth; Interactive Features - "Visual Effects 102" And "Cruella's Costume Creator" (DVD-ROM); Theatrical Trailer. Due to the canine-centric material found in 102 Dalmatians, I felt it would be best to entrust the DVD to a guest reviewer. As such, please welcome my beloved pooch Oatmeal. Take it away, Oat! Whoops - I forgot that dogs can’t type. Oh well - back to plan “B” - I guess I’ll handle the review. I’ll get Oat a copy of Mavis Beacon - perhaps she’ll be back for future articles. As you may be able to glean from the fairly cutesy tone of this review’s start, I have a serious fondness for dogs. Because of this, I’m much more forgiving of excesses in a dog-related flick than I would be in other endeavors. However, this affection has its limits, and I think that if I encountered a sugary pooch-centered film along the lines of the atrocious Baby Geniuses, I’d still hate it. While 102 Dalmatians won’t be confused for a brilliant piece of filmmaking, it largely avoids the painful trappings of other movies that focus on adorable subjects and can be a mildly enjoyable experience. Make no mistake, however: your enjoyment of 102 Dalmatians will almost certainly depend on your fondness for dogs. Even huge dog lovers won’t necessarily get through one of these affairs, as I discovered when I watched the original live-action rendition of 101 Dalmatians back in 1996. My then-girlfriend also adored dogs, and we took in a screening of the film at her request. She’s lucky I didn’t dump her as soon as we left the theater, for 101 Dalmatians provided a dull and drab experience that had little going for it other than a gloriously over-the-top performance from Glenn Close as Cruella DeVil. As such, I can’t say that I really looked forward to my viewing of 102 Dalmatians, and frankly, I’m not sure why I enjoyed it more than I did the original. After all, there’s not much to differentiate the two films. In the first movie, DeVil attempts to turn 101 Dalmatians into a fur coat. In the sequel, she tries to make 102 Dalmatians into a fur coat plus matching hood - that’s why she needs the extra pooch. Many Disney sequels gently reverse the plot of their predecessors. For example, while in Pocahontas, we see the English come to the New World and encounter Indians, in Pocahontas II, our heroine travels to Britain to meet some limeys. I suppose 102 Dalmatians could have taken this route, but since that would mean that the sequel would focus on dogs who try to make Cruella into a coat, the possibilities seemed limited. As such, 102 Dalmatians instead sticks with light variations on the original story. Very light, really, as the sequel truly functions as a remake of a remake. Oh, we see some different elements as the movie starts with a “reformed” Cruella, but once she reverts to her nasty self, the story returns to the first one’s format of good against evil in a race to rescue some sweet little pups. We also get romantic elements through the interactions of Kevin (Ioan Griffudd) and Chloe (Alice Evans) who stand in for the first flick’s couple. Perhaps I shouldn’t say “stand in” since Kevin and Chloe are a completely different pair than the original’s Roger and Anita, played then by Jeff Daniels and Joely Richardson. Nonetheless, the function in the same manner and both actors are acceptable. Evans is lovely and inoffensive, and Griffudd comes across as a younger Hugh Grant, albeit one with a funnier name. Neither excels but nor do they do anything to harm the film. 102 Dalmatians offers two attractions: the poochies and DeVil. In the latter capacity, Close again provides a fun experience. Of course her Cruella in no way resembles anything seen in the real world, but that’s not the point; she’s supposed to be a larger-than-life cartoon character, and Close chews the scenery with delicious glee. As for the dogs themselves, they seemed consistently cute and fun. Happily, 102 Dalmatians largely avoids the potty humor that mars many kid-oriented flicks. Sure, one of the pooches - the appropriately-named Drooler - excretes an awful lot of saliva, but it remains well below Beethoven levels and isn’t exploited on too many occasions. Otherwise, 102 Dalmatians is nicely free of urine, excrement or other bodily secretions. Easily the star of the canine show is sweet little Oddball, the Dalmatian without spots. I don’t know if it was due to the lack of dots or the dog herself, but she was God-awful adorable; the pups they used to play the role seemed especially cute and cuddly. My only complaint with the way in which Oddball was portrayed stemmed from her identity crisis. Throughout the film, we see that she wants spots so she can fit in with the other dogs. However, while the movie could end with her acceptance of her unusual appearance, instead it chooses to “reward” her with spots. I thought this was a somewhat reactionary decision that felt awkward. Nonetheless, 102 Dalmatians offered inoffensive entertainment that rarely provoked much reaction from me in either direction; I didn’t love it, but I thought it was watchable and moderately entertaining. It doesn’t compare with the fun of the original animated 101 Dalmatians, but it’s at least as good as the 1996 live-action effort. Ultimately, for someone who loves dogs, it’s a decent little flick; for those less enamored with the species, it certainly will offer less charm. 102 Dalmatians appears in an aspect ratio of approximately 1.85:1 on this single-sided, double-layered DVD; the image has been enhanced for 16X9 televisions. Please note that a fullscreen version of 102 Dalmatians also exists and can be purchased separately. This review will only cover the widescreen edition of the film. As one might expect, the picture looked quite good, with all of the earmarks of a recent, big-budget flick. Sharpness seemed consistently positive throughout the film. I saw no signs of softness or fuzziness at any time, as the movie presented a crisp and well-defined image. Although I witnessed no jagged edges, some very mild examples of moiré effects appeared when blinds appeared on screen. Print flaws seemed totally absent. I never detected any defects such as scratches, speckles, grit, grain, hairs, or other problems; the movie looked clean and fresh. Colors appeared bright and vivid throughout the movie. The film displayed a nice variety of bold and attractive tones and the entire palette maintained good stability; the colors stayed accurate and solid at all times. Black levels came across as deep and rich, and shadow detail was clear and appropriately opaque. Ultimately, 102 Dalmatians offered a very satisfying visual experience. Also compelling were the film’s soundtracks. As is the case with many recent Disney DVDs, 102 Dalmatians offers both Dolby Digital 5.1 and DTS 5.1 mixes. As is also often the case, I could discern virtually no difference between the two tracks. In this instance, the audio seemed identical and I didn’t note any ways in which they diverged. 102 Dalmatians featured a fairly forward-oriented soundfield. The audio presented a nicely active and lively environment across the front channels, as effects were placed realistically and cleanly within that spectrum. These elements blended together neatly and provided a positive impression with a great deal of well-localized audio. In regard to surround usage, the rear speakers mainly stuck with reinforcement of the forward elements. Quite a lot of music came from the surrounds, and a fair amount of effects also stemmed from the rear channels. Some of this was unique to the surrounds, and they occasionally displayed some good discrete audio. However, 102 Dalmatians wasn’t a very showy flick, so although the soundfield complemented the movie nicely, it wasn’t a terribly impressive affair. Audio quality appeared solid. Dialogue consistently sounded natural and crisp, with no signs of edginess or problems related to intelligibility. Music seemed clear and acceptably dynamic, though I felt those elements could have displayed better low end. At times, some songs - particularly the appearance of “Le Freak” during Le Pelt’s fashion show - offered excellent bass, but sometimes they lacked the expected depth. Effects also came across as clean and accurate, and though they didn’t often display tremendous bass, when the subwoofer kicked in, it did so nicely, and the mix could present some solid dynamics. Ultimately, 102 Dalmatians featured a good but unspectacular soundtrack, albeit one that generally worked well for the film in question. On this DVD of 102 Dalmatians, we find a modest complement of supplements, starting with an audio commentary from director Kevin Lima plus a mix of animal experts. Included along with Lima are animal coordinator Gary Gero, animal trainer David Sousa, and lead puppy trainer Julie Tottman. The three men were recorded together while Tottman was taped separately and her statements were edited in to the rest of the track. Unsurprisingly, Lima dominates this decidedly low-key affair. For obvious reasons, the other participants mainly focus on the ways they helped get the dogs to perform, while Lima contributes information about a variety of subjects. He gives us a decent little look at the way the production progressed and offers some good notes about the actors - especially Close - and the challenges of working in this kind of project. It’s not a terrific track, but it provided a fairly interesting look at an unusual topic, and I appreciated the attempt to do something different. Next up are three Featurettes about 102 Dalmatians. “Creating Cruella” lasted for four minutes and 40 seconds and it concentrated on the ways in which Glenn Close attempted to bring the villainess to life. “Animal Actors” ran for seven minutes, and it focused on the methods used to get the critters to perform, while “Designing Dalmatians” went for five minutes and 55 seconds and looked at the techniques used to create the film’s visual environment. All of them combined film clips, sound bites from relevant participants, and shots from the set. All were mildly interesting, but “Designing Dalmatians” was the best of the bunch, especially since it gave us a nice glimpse of the ways in which computer effects worked on the dogs. More of that kind of information appeared in Visual Effects 102. This interactive program was hosted by “Waddlesworth” - or at least an actor standing in for original voice Eric Idle - and it lets you check out a variety of effects scenes in a step-by-step manner. It’s a fun and interesting little extra. One Deleted Scene made the DVD. Called “Cruella’s Release”, this segment lasted 55 seconds and it can be viewed with or without commentary from director Lima. It’s a decent little snippet, but it would have been redundant in the film, so it was wisely excised. Lima aptly details the reasons for its removal. Puppy Overload copies a similar feature on Gone In Sixty Seconds. During this 70 second presentation, we see a montage of “action” clips from the flick, all compiled into “music video-style”. Umm… okay. Well, I suppose it doesn’t hurt anyone. Many times during this DVD, you’ll hear warnings not to adopt a Dalmatian unless you’re truly prepared to care for an high-maintenance pooch. A disclaimer states this in the end credits, and the topic arises a few times during the audio commentary. “Dalmatians 101” provides another reminder in this 70 second presentation. Geez, the way they make it sound, there are only about seven people on the planet who should own Dalmatians! In addition to the film’s theatrical trailer, one decidedly lackluster extra appears in the form of a Soundtrack Promo. Here we find a 40 second clip of female pop act Nobody’s Angel. They lip-synch “Whatcha Gonna Do” and we also see some clips from the movie. Why they couldn’t have provided the entire song is a mystery to me, but all we find is this brief snippet. The tune itself is nothing special, but a couple of a singers are pretty cute, so I won’t complain. 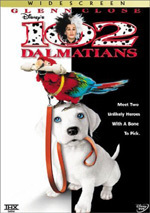 102 Dalmatians tosses in a few DVD-ROM materials. “Cruella’s Costume Creator” is a game in which you have to flip different sketch cards to compile a variety of Cruella’s outfits from the movie. To make it more challenging on the “Medium” and “Hard” levels, a dog’s paw periodically disrupts your progress. Despite that, it’s a lame game that gets old quickly. The DVD-ROM area’s only additional extra is a link to the official 102 Dalmatians website. Lastly, we find the often-disliked “forced trailers” that appear at the start of many Disney DVDs. Here we get ads for Atlantis: The Lost Empire, Snow White and the Seven Dwarfs, The Emperor’s New Groove, and 101 Dalmatians: The Animated Sequel. As always, these can be easily skipped with the press of a button on your remote; as such, they don’t bother me at all. Usually the “Sneak Peeks” area of Disney DVDs simply replicate the ads found at the start of the disc. However, that’s not the case with 102 Dalmatians. Here you’ll find promos for The Book of Pooh, Lady and the Tramp II: Scamp’s Adventure, Monsters Inc., and The Hunchback of Notre Dame II. 102 Dalmatians doesn’t show Disney at their best, but nor does it demonstrate the studio’s worst output. As a whole, it provided a somewhat lackluster but mildly entertaining piece that ultimately worked acceptably well due to the presence of a compellingly excessive Glenn Close and a slew of adorable pooches. The DVD offers strong picture and sound plus a smattering of minor extras. Dog lovers may want to give this one a look.